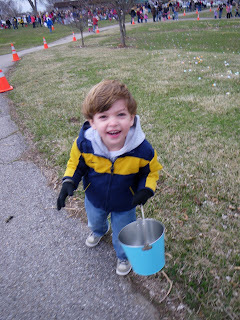 Took Ben to the city Easter egg hunt this afternoon. And the weather never disappoints. In the 3 years we've gone, every year it rains/hails as we leave, but I have to admit at 50degrees, it was warmer than years past. The Easter bunny was there and Ben wanted nothing to do with her. 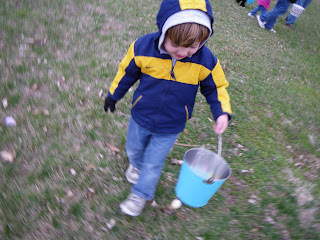 He also wasn't too into getting eggs this year either. Everytime he reached for one some little kid would snag it.. I guess 15,000 eggs isn't enough for some kids. 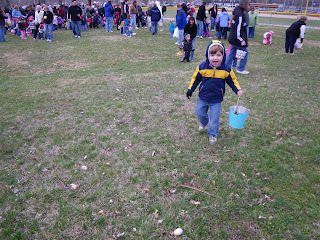 who needs eggs to have fun and Ben looks like he is enjoying himself.